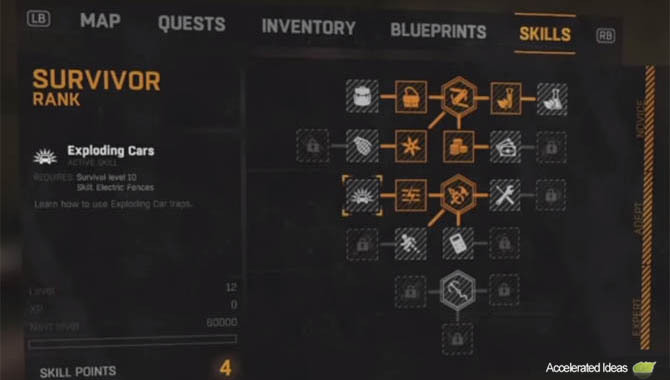 Not a million miles away from most role playing games, the Skill Tree in Dying Light is a character progression mechanic which is split into 3 main sections - Power, Agility and Survivor. Players can spend their skill points upgrading the skill trees to unlock new perks and abilities. As the name suggests, the skill trees are a tiered system that branch out into multiple paths. Progression moves downwards and outwards in Dying Light. Thus players need to rank up and unlock the skill perks higher up the tree to gain access to the lower level perks. Similarly, unlocking a skill perk opens up the opportunity to unlock the adjoining branches (left and right) of the perk. I'll go into the details of each of the Skill Trees below but the general gist is that the Power tree unlocks perks for combat. Agility is for stuff like parkour and movement whilst the Survivor tree unlocks useful perks such as reducing purchase costs at vendors and gaining blueprints earlier. There are 23 levels for Agility, 23 levels for Power and 21 levels for the Survivor tree. Each skill requires a certain Level and in some cases a pre-requisite skill must be unlocked first. For example the Drop Attack perk which is under the Power section requires Power Level 7 and also Combat Adept to be unlocked first. Unlocking perks is an important part of character progression in Dying Light and the way you unlock these perks is slightly different for each skill tree. It's essential that you progress all trees if you want to survive beyond the first few nights so taking part in a varied selection of activities is the way forward. At the end of the day your Skill Levels are determined by XP and the game clearly shows your progress to the next skill level when you've got the Skills menu open. As most of you are probably looking for the best perks in Dying Light here's my list of the best perks and why you should unlock them. I personally like to move fast in the game so Agility skills which improve parkour are high on the list. This perk boosts your health allowing you to take more damage before dying. It saves many unwanted trips to the safe house and is especially useful when you want to go exploring at night to find some of the rare items in the game. Combat Adapt gives you more stamina for attacks. At the start of the game the stamina bar in Dying Light is very slow, making a full on fight near impossible. This situation gets worse when you get heavy weapons such as the two handed sledgehammer. Get this perk unlocked early in the game to start taking on zombies rather than running away from them all the time. An essential skill for finishing off an enemy quickly. If you don't finish off an enemy they'll probably get back up and start fighting you again which only slows you down further. One kick to the head and you can pick up the loot. A hell of alot of fun to use and also very effective. The drop kick is powerful enough to knock enemies into spikes or drop them off the edge of a rooftop. When used in combination with Stomp, a knocked down enemy can be finished off with the stomp move, at which point you can claim the loot for yourself. Parkour in Dying Light is painfully slow unless you've got this perk unlocked. It increases your climb and movement speed, making it easier to transverse the open world and get from A to B more efficiently. It also has the added benefit of helping you progress your Ability rank faster. Moving between rooftops is the best way to avoid zombies but it comes at a risk. Any falls will probably kill you if you don't have the Light Drop perk combined with the Forward Roll. It's also far easier to get down from a building by having the option to jump down rather than find safe ledges all the way to ground level. Access to the basic blueprints such as firecrackers and lockpicks. It's surprising the number of times you'll use a firecracker to distract zombies whilst lockpicks provide the chance to access a new area with more potential loot inside. Survival > Lucky Repair to avoid repairing all the time. Survival > Exploding cars, perfect for night adventures. Agility > Brutal Grapple, combined with Stomp you can easily kill enemies without weapons. Power > Blast. Increased damage to throwing weapons, essential before firearms are available. Power > Conserve Weapons. Weapons degrade slower and need fewer repairs. Power > Focus. Bonus damage from additional hits on the same target. Power > Kill Frenzy for faster XP. So that's my list of the most useful perks so far. Below I've included a list of all the skills in the game. The Power tree contains unlocks for more attack options. You increase your Power Rank by engaging in combat and using the Power perks which you previously unlocked. Stun (lvl 2) - attack with greater precision including the possibility of stunning enemies when using a blunt weapon. Multi-Throw (lvl 3) - target up to 3 enemies with throwable weapons. Kick stun (lvl 3) - stun zombies using a basic kick attack. Blast (lvl 9) - cause double damage from your throwing weapons. Stun Kill (lvl 12) - option to instantly kill enemies after they're stunned. Sturdiness (lvl 4) - absorb more damage. 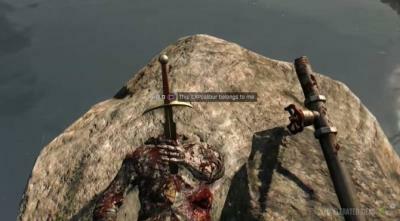 Melee Throw (lvl 4) - throw any melee weapon causing high damage. Weapon can be retrieved afterwards. Combat Adapt (lvl 5) - receive more stamina enabling you to attack more often. Conserve Weapons (lvl 6) - weapons are more durable i.e. less repairs needed. Power Attack (lvl 6) - hold the trigger button to unleash a more powerful charged attack. Windmill (lvl 8) - spin around using a two handed weapon to attack enemies from multiple angles. Focus (lvl 8) - successive hits against the same target deal bonus damage. Great for tough opponents. Stomp (lvl 9) - crush a zombies head to finish them off. Ground Pound (lvl 10) - jump and strike the ground with a powerful smash that knocks enemies over. Kill Frenzy (11) - Power XP is increased for 10 seconds after a kill. Whirlwind (lvl 11) - windmill attacks consume only half stamina. Slam (14) - improves the range of force of Ground Pound. Drop Attack (lvl 7) - a powerful airborne execution attack for one-handed weapons. Combat Expert (lvl 12) - more stamina. Sturdiness 3 (lvl 13) - gain extra health. Takedown (lvl 13) - kill enemies from behind. Ultimate Combatant (lvl 24) - never get tired while fighting. Agility perks relate directly to your character's movement including most aspects of parkour. You increase your Agility rank by running, climbing and using the Agility perks you previously unlocked. Dodge (lvl 2) - quickly shift to one side to dodge zombies. Slide (lvl 3) - perfect for a last minute dash away from enemies or through a doorway. Grapple (lvl 3) - use the enemies movement against them e.g. throw enemies to the side when they charge you. Health Regen (lvl 5) - regenerate health to a higher level. Leg Breaker (lvl 6) - break legs during the Slide. Brutal Grapple (lvl 9) - grappled enemies are left vulnerable. Dropkick (lvl 4) - run and jump with a deadly kick that sends zombies flying. Can be used in combination with spikes and building edges to quickly kill off zombies. Vault (lvl 4) - use an enemy as a pole vault to reach greater heights. Drop Kick Bomb (lvl 7) - dropkicks deal triple damage. Vault Stun (lvl 8) - stuns enemies you vault over for 5 seconds. Freerunning Adapt (lvl 5) - run for longer and climb faster. Escape (lvl 6) - escape from biters faster. Light Drop (lvl 6) - reduces the damage you take from falling from great heights. Forward roll (lvl 10) - avoid fall damage entirely by using a forward row to break your fall. Instant Escape (lvl 9) - break free from Biters faster. Backlash (lvl 7) - use throwing weapons or the flashlight behind you while running away. Tackle (lvl 10) - nudge enemies out of the way while running. Requires considerable sprint. Ram (lvl 11) - tackles deal high damage. Reversal (lvl 14) - escaping from Biters will stun them. Freerunning Expert (lvl 12) - reduced tiredness from running and climbing. Tic Tac (lvl 13) - run up walls or other flat surfaces. Health Regen 2 (lvl 13) - improves health regeneration considerably. Ultimate Runner (lvl 24) - you don't get tired from running, climbing or jumping. Survival Starter Kit (lvl 2) - get blueprints for essential items like fire crackers, lockpicks, molotov cocktails etc. Boosters (lvl 3) - gain the blueprints for crafting boosters (like potions) which increase attributes for a short duration. Master Backpacker (lvl 6) - 6 more slots for carrying weapons. Booster XL (lvl 6) - booster effects last longer. Barter (lvl 4) - gain a 10% discount at vendors. Elemental Throwing Stars (lvl 4) - a deadly alternative to the standard throwing stars e.g. fire. Haggle (lvl 8) - shop slower prices by an additional 10%. DIY Grenades (lvl 8) - learn how to craft new grenades: shrapnel, bleeding, paralysing and toxic. Trap Bombs (lvl 11) - bombs that attract enemies then explode. Hard Bargain (lvl 11) - sell items for a better price. Crafting Expertise (lvl 5) - you can craft more things using the same amount of components. Electric Fences (lvl 7) - one of the usable traps in the game. Unlocking this perk allows you to activate electric fences, creating a deadly barrier in the open world. Exploding Cars (lvl 10) - another usable trap. Unlocking this perk allows you to explode cars, attracting and killing many zombies in one go. Lucky Repair (lvl 7) - be more efficient at repairing weapons. Nimble Hands (lvl 10) - collect resources faster from dead enemies. Shield Mastery (lvl 8) - build a shield and use it offensively or defensively against zombies. Camouflage (lvl 9) - spread zombie remains on your body to blend in and avoid attention from other zombies. Shield Crafting (lvl 11) - learn how to add elemental effects to shields e.g. electric, stun, blast. Camouflage Attack (lvl 12) - you don't attract attention when killing zombies whilst camouflaged. Grappling hook (lvl 12) - get a grappling hook to climb buildings quickly. Specialist (lvl 13) - increased chance of critical hits. Craftsman (lvl 14) - elemental weapons deal more damage and the effects last longer. Ultimate Survivor (lvl 25) - additional health boost. Camouflage, grappling hook and shields are more efficient.